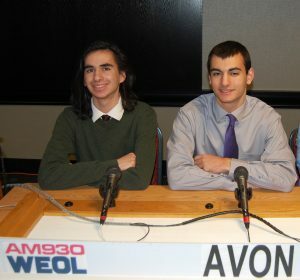 This week it’s Avon and Oberlin, excellent schools at opposite ends of the county. 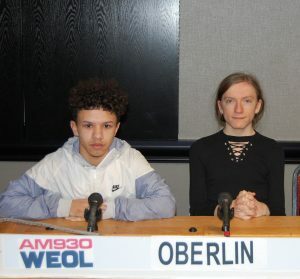 Representing Avon are Jacob Boesger, left, team captain Alex Stamatis, right, and Cade Grant (not pictured), and from the academic team of Oberlin High School, the players are Ario Thompson, left, and Nicole Bertoni, right. The outcome will advance the winning team to our semifinals in May. Click above to hear the competition (opening in a separate window is recommended) or, if you can’t wait to learn the final result, go directly to the spoiler, our official news release.